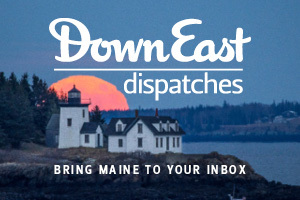 One author’s obsession with Acadia’s unnoticed memorials and secret trails. [L]ike many before us, my wife, Marycarol, and I fell in love with Acadia National Park the moment we arrived, in the summer of 2002. Prior to that, we’d visited 30 national parks and were enthralled by each of them. 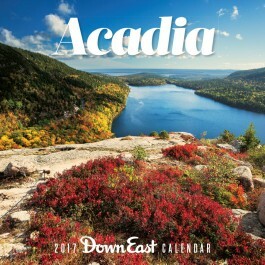 But Acadia is unique, and it intrigued us in a very different way. For starters, the human footprint in Acadia is more conspicuous than in many of the country’s other marquee parks. 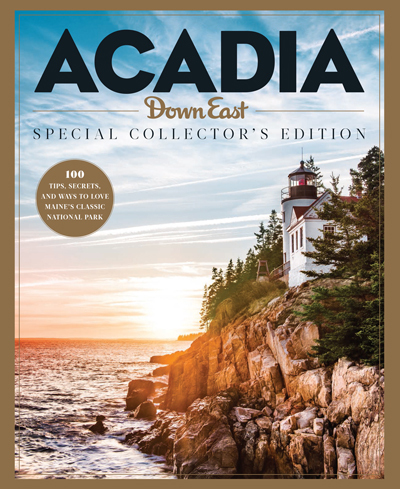 And at only 47,000 acres, mostly on Mount Desert Island, it’s possible to explore Acadia in intricate detail. After extensively hiking Acadia’s trails as a Ridge Runner and Waldron’s Warrior for Friends of Acadia, I found myself increasingly interested in the park’s many memorials — trails named for historic people, but also the metal plaques and granite engravings that I’d been blindly hiking past. Many were tucked out of easy sight, on little-used trails or off-trail altogether, and with the exception of John D. Rockefeller, Jr., I knew nothing about the people they honored. Curiosity seized me: I would learn about them. I told Marycarol it would be a good wintertime project, something I’d have no trouble completing by spring — I’d been a researcher for the federal government, after all. Five years later, after countless visits to cemeteries, libraries, historical societies, parks, even a railroad yard — travels that took me from Maine to Lake Geneva to Lake Okeechobee — I finished my research and published a book about it. In all, I found 56 memorials throughout the park, commemorating those who helped to build it and those who simply loved it. The honorees ranged from the prominent — like John Innes Kane, an heir to the Astor fortune and early benefactor of the nascent park — to the less renowned — like Lilian Endicott Francklyn, a former New York debutante who died young on the eve of the Great Depression. During my explorations, I sometimes noticed hints of hidden trails branching off from those I knew. Some were disguised by leafy barriers; others appeared as narrow, treeless corridors through dense woods; several were marked by small rock piles. 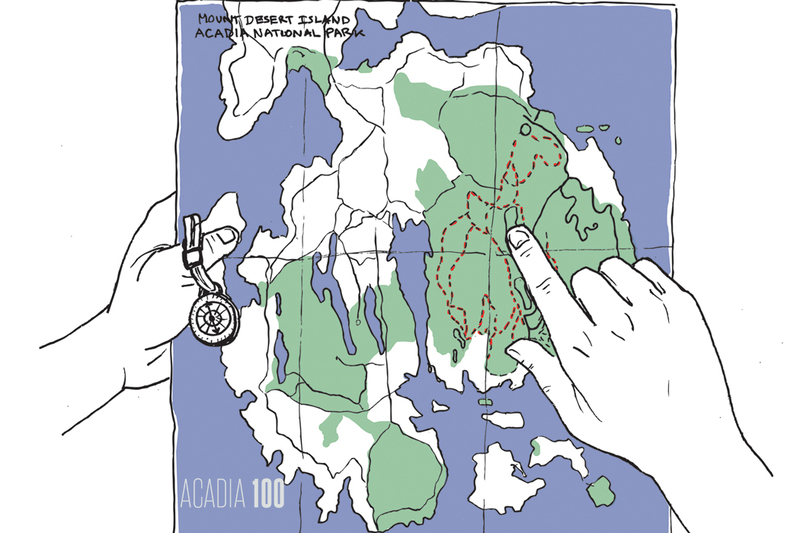 The National Park Service maintains some 135 miles of trails in Acadia, but layered behind this network are another 100 miles or more of old, unmaintained trails. They can be found on vintage maps of the sort I used during my research, and many are memorials themselves, named for this or that near-forgotten MDI personage. And so, armed with a library of old maps and a hand-held GPS, I made a hobby of exploring these ghost routes, long disappeared from contemporary trail maps. To prevent injuries and protect plants and wildlife, rangers discourage, but do not prohibit, hiking off the approved, maintained trail network. This is not unwise. Some old trails are overgrown; others are dizzyingly steep and lack the iron railings that once served a distinct purpose. I have crawled on my belly to peer over abrupt ledges, looking for signs of such old supports. And yet some trails seem only recently abandoned. Near one summit, not far from Seal Harbor, is an inconspicuous bronze memorial marking “The Van Santvoord Trail.” John Van Santvoord, a New Yorker, was the path committee chairman of the Seal Harbor Village Improvement Society from 1907 to 1913. Some of the island’s most iconic trails owe to his design, and the loop trail named in his honor, otherwise unmarked, is still superb, with spiraling granite staircases in fine condition. The trail is also observing its centennial, dedicated in 1916, three years after its namesake’s death — but the last park map it appeared on was printed in 1942.  Despite their quasi–out-of-bounds status, Acadia’s forgotten trails and overlooked memorials fascinate me because they link us to history, and many were installed by family, friends, and admirers to remind us of the good these individuals did in creating, expanding, and maintaining what’s now the park. To me, exploring these places is a kind of tribute to their memories, and I share my knowledge hoping that others will be inspired to help preserve similarly beautiful places.